Description: Dating from 1695, this one-act opera of some 85 minutes is structured as a series of reflections on the sentiments, joys and sorrows of man's life, made by eight characters set in a pastoral context. The Titan Atlas is entrusted with the prologue, which has the purpose of introducing to the events and summarizing their purpose: men should be granted a pause from their sufferings and labors at least during the days consecrated to Bacchus, the soother of all ills. Over witty verses, Steffani weaves a rich score, characterised by great writing variety. 2 CDs. No libretto. 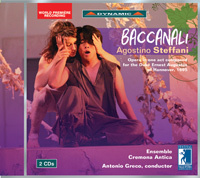 Eight soloists, Ensemble “Cremona Antica”; Antonio Greco.